Contractors, homeowners, and industrial facilities are in constant need of temporary storage buildings to shelter machinery, equipment, and bulk materials. Fabric covered storage buildings provide the quick and cost effective solution for applications when a temporary short term storage solution is required. It is well known that permanent storage buildings such as wood and metal structures require building permits which add to lead times. Fabric covered temporary storage buildings typically do not required building permits which improves the lead time for construction. 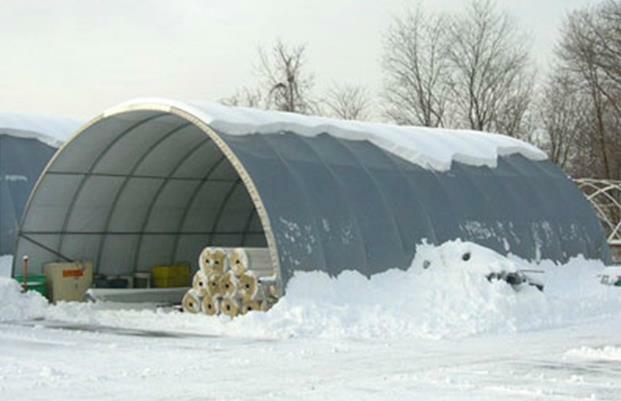 In addition, fabric storage buildings can be quickly erected without the need for special tools beyond a lift. Our temporary buildings can be erected on block walls, concrete pads, gravel, dirt, and asphalt. All temporary storage buildings and tents come complete with a detailed instruction manual and can be shipped to anywhere within the United States and Canada.